Why did Putin kiss a boy's belly? 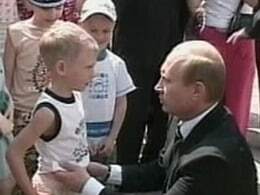 July 12: Video of Russian President Vladimir Putin kissing a little boy's belly has raised eyebrows worldwide. Comedian Mo Rocca joins "Countdown" host Keith Olbermann to examine what the heck was going on there.